Are you interested in joining the Prelude String Orchestra? Click here for details. MEETS ON: Mondays from 5:30-7 P.M.
Target Age Group: Elementary school students. Prelude String Orchestra provides an introduction to large ensemble playing and prepares students to advance to the Intermezzo String Orchestra. Students entering PSO for the first time should have a minimum of 2 years previous study on their instrument, and demonstrate note-reading readiness. No student audition is necessary, however a teacher recommendation is required to ensure that the student is appropriately placed. The recommended minimum age for PSO is 8 years old, or entering 3rd grade. The recommended maximum age is 11 years old, or entering 6th grade. Exceptions to these recommendations can be made by the PSO Conductor. 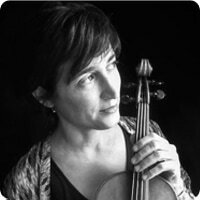 Carla Kountoupes, violinist, is a member of the Santa Fe Symphony Orchestra, Arizona Opera Orchestra, Santa Fe Pro Musica Chamber Orchestra, and Piazzolla da Camera Piano Trio. She is a graduate of Oberlin Conservatory (Violin Performance) and Oberlin College (English Literature). Carla has toured and performed professionally with orchestras and chamber ensembles in Central America, Taiwan, Germany, and all over the United States, including as a member of the New Century Chamber Orchestra in San Francisco and the Costa Rican National Symphony Orchestra. Carla enjoys performing and recording many genres in addition to classical, such as Latin-world, alt-rock/pop, and jazz. A dedicated music educator, Carla holds a Master of Music degree in Music Teaching. She has taught private violin lessons to children and adults for more than 20 years and is currently on faculty at the New Mexico School for the Arts. Carla was awarded Music Teacher of the Year in 2016 by the New Mexico Chapter of the American String Teachers Association, and is a conductor with the Santa Fe Youth Symphony Association. She directs a thriving orchestra program in the Santa Fe Public Schools and in the summers she teaches, conducts, and performs at the renowned Sitka Fine Arts Camp in Sitka, Alaska. Carla’s violin was made in the 1740’s and was inherited from her grandfather.